About a month ago one of the kids noticed that our momma cat, Chuck Norris, was putting on some weight. I inwardly groaned because I knew it meant that Chuck was in a family way. Her last litter of kittens was about four months old at the time and while we like to keep a cat or two around, we don’t want to get crazy with feline overpopulation. Typically when we notice a cat is pregnant around here there is usually time to prepare for the blessed event. I told the kids we had about a month before the kittens came, but Chuck Norris, well, she likes to keep us on our toes. A mere week after our discovery, we had another discovery: four teeny tiny kittens in a barrel out by the shop. Our oldest daughter’s pup, Josie, took to barking at the kittens, which wasn’t much of an issue considering their ears were still shut, but apparently Chuck didn’t much care for it. A little over a week ago she moved her babies to an unused doghouse right by our front porch. Josie didn’t bother them there and all seemed right with the world. They figured out how to crawl and wiggle out into the sunshine and loved being paid attention to. They just needed giant sunglasses and they’d have been little kitty Kardashians. While I was at homeschool co-op and our oldest was at home, she discovered one had nearly drowned after she wiggled out of her house. After some drying and lovin’-on, she perked up, Abby secured them all back into the doghouse while the rains kept coming. Then Chuck decided that her accommodations were worthy of a scathing Yelp review and left her kittens high and dry. Actually, low and soaked. So in the middle of a downpour, we moved a barrel to the porch, put the kittens in it, and Chuck deemed it suitable. And then the winds came. The barrel started filling with water, again soaking the poor critters. When I went out last Monday morning one kitten was gone, two were soaked to the bone, and one was barely breathing. Chuck would have nothing to do with them and kept bolting away when we tried to put her with the wet little varmints, running for cover like she was insisting the rain was going to make her hair frizzy. We found most of our Monday school day whittled away by bottle feedings and mewling kittens. My husband was less than thrilled that our No Indoor Pet policy had been pushed aside in our humanitarian (felinatarian?) attempts. I was adamant that we were doing the right thing and that we were only showing our kids how to be kind to animals. But at 3 am when those kittens started hollering that the milk replacer was gross and they missed their momma and could they see Santa and “Are we there yet?” all rolled into a bunch of “She’s touching me!” type shrill squeals and meows, I found myself having misplaced my kindness. I found myself with a scratching, wiggling ball of fur in one hand while I blearily tried to fill a miniscule bottle with milk replacer and warm it so as to not scald the poor thing’s gizzard. It was a flashback to when my own kids were newborns, although with less scratching, but pretty much the same amount of yowling. Since then Chuck has been forcefully placed into a confined area with her kittens and is only let out when the little ones aren’t screeching with all their might. She glares at us when we let her out and I’m pretty certain that look says, “I’d rip your heart out right now if I could.” And again, it is reminiscent of when my husband and I had a newborn. I’m pretty sure I blearily directed that thought at him more than once at 2 am. I love Halloween. So much so that we’ve had our Halloween decorations up since the first week of September. We have these really cool pictures that look like old black and white photos but when you get close they are skeletons, vampires, zombies, etc. Our fireplace beheld a pile of bones until my husband evicted ol’ Boney Maroney when he installed our new gas logs. Now ol’ Boney just hangs out all piled up in a galvanized bucket next to the TV. There are creepy cobwebs hanging everywhere. Actually, that’s not just a Halloween thing, just my lackadaisical housekeeping. I used to go all out on Halloween costumes. Halloween costumes and Valentine’s Day boxes brought forth a part of me that stayed hidden the rest of the year, but come October and February I was a woman obsessed. I stayed up until 3am on more than one occasion crafting and building costumes and boxes. All I can figure, I was a lot younger and really cared way too much about what other people thought. Now I’m old and don’t give much of a hoot. And since we homeschool and they’re older now, costumes (and Valentine boxes) haven’t been a big deal around here for awhile. In fact, we haven’t trick-or-treated since I made this deal with the kids: You don’t make me create a costume for you and drag you out in the wind/cold/heat/crowds, and I buy you a metric ton of candy and let you stay up as late as you want. It’s my favorite Halloween tradition. This year a friend of ours decided to host a costume party. And my children got really excited. I made the standard candy/stay-up-late offer and even said I’d watch scary movies with them, but no, the little extroverts wanted to go to the party. Then the himming and hawing began over costumes. And to top it all off, the oldest daughter wanted to dress up for work and she wanted to be “super scary”. Because that’s what everyone who comes in to the restaurant want to see while they eat – her creepy scary zombie doll clown vampire face. The two youngest kids decided on cosplay-type costumes from the Batman comics – The Scarecrow and Harley Quinn. Fortunately Kady’s costume was her idea alone and she did the entire thing herself (the Overachieving Force is strong with that one) and the oldest decided on a mime (decidedly un-super scary, but sufficiently creepy for those of us with clown phobias already). The girls’ ability to create theirs on their own left me to work on their brother’s costume. By 11pm the night before Halloween I had enough burlap fibers on me to make me look like a crazy cat lady and my dining room had little bits of twine pretty much everywhere. In an attempt at singeing the cut edges of the eye holes, I managed to catch the mask on fire and here’s some wisdom for you: flaming burlap fibers will embed under the tender flesh of the pad of one’s finger. Then after I stitched the mouth with some sloppy, creepy stitches I realized the mouth was smiling happily, not grimacing menacingly. I, however, was grimacing as I pulled out the stitches to start over. And itching from an apparent burlap allergy. Be still my Halloweary heart. I’d melt burlap into my finger every day of the week for that. 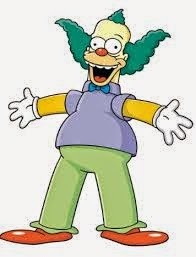 Krusty the Clown from "The Simpsons"
I was 13 and had just been given the key to Pandora’s Box when my dad took me with him to the college library while he was doing some research for a paper. I sat cross-legged in the floor on the second story of the NEO library and read excerpts and passages of a seemingly endless supply of horror novels, creeping myself out, page by page. I had never had access to such a collection of “grownup” books and I was ecstatic. The book I settled on that night – my very first scary read – was “The Bachman Books”. It was a collection of Stephen King’s first stories when he was writing under the pen name Richard Bachman. And just like that, with those four short novels, I was hooked. Between my scary book obsession and my best friend and I watching low-budget horror films (rented from Showtime Video – anyone remember that place?) virtually every weekend of our adolescence, I developed a bit of a fascination with the horror genre. I love to be scared. I have read virtually every Stephen King book ever published – most of them more than once. I got Mr. King’s book “It” in all of its 1,138-page hardcover glory when I was 14 and began reading it as the family took off for a Branson vacation. I can’t tell you much about our trip to the Country Music Capital of the World that go ’round, but I can probably tell you anything you would want to know about Derry, Maine, where the story took place. I read it so feverishly and incessantly that I ended up carsick on those Ozark Mountain backroad hills. I was also reading it late one night (when I was supposed to be sleeping) by the light of a flashlight while covered up in a blanket. My mom came in to put up some laundry not having a clue that her opening my bedroom door would shave about 47 years off my life. As she stepped into my room, all she saw was a flashlight, a giant book, a blanket, and her daughter shoot straight up into the air followed by a round of nightmarish screams. When I realized she wasn’t Pennywise the clown coming to drag me into the sewers to kill me and she recovered from the heart attack I had just given her, we both busted out laughing. 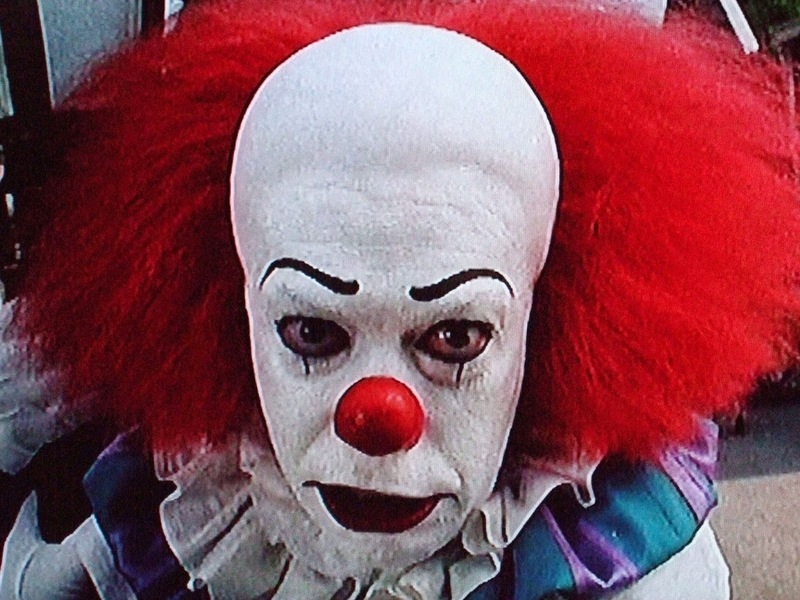 I have a short list of phobias: water, spiders, heights, sewer grates, and clowns. The last two items on that list are directly because of the aforementioned book. It is the most haunting of Mr. King’s novels in my opinion and has stuck with me well into adulthood. Now, this might seem a bit oxymoronic – the girl who loves to be scared is phobic and terrified of something, but call it what you will. All I know is: clowns really freak me out. Really. Spiders freak me out, too, but after having been bitten by a black widow, I think anyone would be slightly scared of them. But clowns…..man. 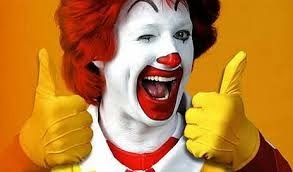 *shiver* Ronald McDonald is one scary dude in my opinion. There are different schools of thought regarding phobias. Some say immersion therapy is the most effective way to overcome a phobia or fear. Immersion therapy simply baby-steps a person into different levels of contact/experience with a particular phobia until they have overcome their fear. I’m not 100% convinced. Although I guess I shouldn’t scoff at something that is regarded amongst the psychiatric community as successful. I guess if there’s a doctor out there willing to set up a scenario regarding a clown who jumps off of a skyscraper into a body of deep water where he water skis on a sewer grate to a pit of spiders, I’d be open to watching that and see where things go from there. 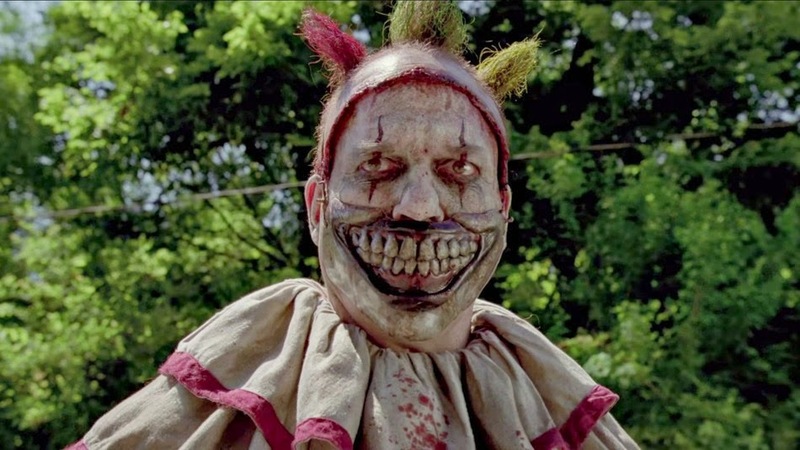 from "American Horror Story: Freakshow"
Dude is seriously messed up. On second thought….nah. I’m okay avoiding clowns for the rest of my life. I’m not a big fan of McDonald’s food anyway. We are a one income family and have been for most of our married life. Please don’t misunderstand – we aren’t living on one income because that’s all we need to live on; no, we live on one income because it’s our choice. We do without a lot of things in order to make it work. It’s not for everyone. Living frugally to the extreme isn’t easy and it’s not for everyone. Sometimes you just have to get creative and do the best you can. Sales are my best friend come menu-planning day and I take my shopping very seriously. A few weeks ago the little grocery store near where we live had a great sale on fryer leg quarters. It was limit two and I wanted to get as many as I could before they went off sale. (Please don’t judge – it didn’t say “Limit two per household forever” or anything.) I picked up two and sent money with my oldest daughter to pick up two more when she got off work that night. I never thought that she didn’t know what a fryer leg quarter looked like, but later realized that at nearly 18 I guarantee you I didn’t know what they looked like either. I told her the price per pound and that they were in 10-pound bags, so they should be $6.80 a bag. She wrote all of that down along with “fryer leg quarters – CHICKEN” on a scrap of paper, tucked it into her purse with my $20 and headed to work. That night around 9:30, she walked in the door with a rather large plastic bag of flat, frozen hunks of meat and a very upset look on her face. She held it out at arm’s length and asked, “Is this what you wanted?” I squinted at the contents and shook my head. Her shoulders slumped as she said, “I didn’t think so. But oh, let me tell you the story.” I gingerly took the bag of frozen meat pucks and inspected it, trying to not bust out in hysterical laughter only because I knew she was upset at not fulfilling her duties that night. She then told me how the nose-picking, slack-jawed hillbilly kid at the register stared at her blankly and said, “Uhm….yeah…..uh….I got no idear what y’all are talkin’ ‘bout. I don’t know ‘bout no fr’ar leg quotters,” to which my outspoken daughter then said, “Well then, I think maybe you should find me somebody who does.” The kid was still knuckle-deep in a nostril as he called for “someone from the back” who, coincidentally, had no idea what she was talking about either. He did, however, manage to dig up the bag of mystery meat and said, “I don’t know if this is what you want, but it’s only five dollars so….” and trailed off as if she should be pleased at the $1.80 price difference. She was not, but she was also tired and irritated. One adventurous night a few weeks ago I decided to make the Mystery Meat for dinner. Abby took a picture of them and put it on Facebook. Several people commented, saying they wanted to throw up just looking at them. A few said we were crazy for eating them. A few tried to identify them. Turns out, they were backs. Chicken backs. *shudder* The family said they tasted good, but about an hour and a half after dinner we were all in the kitchen looking for a snack. Turns out, there just isn’t a whole lot of meat on a chicken’s back. *Certain author liberties were taken with this story. There are no actual hillbillies working at the local grocery store. Nor were any noses picked during the incident in question. So says Abby. She might also be protecting her secret hillbilly boyfriend who bought up all my cheap fryer leg quarters.